One of my favorite places in Tokyo is Ueno Park, which I visited during cherry blossom season in 2001. During cherry blossom season the trees are white, as with snow, and people sit on blue tarps drinking beer and sake and singing karaoke. This visit, however, was on a cold and gloomy day. In winter, there are no leaves on the trees, and the blue tarps for ohanami are replaced by the blue tarps of homeless encampments. 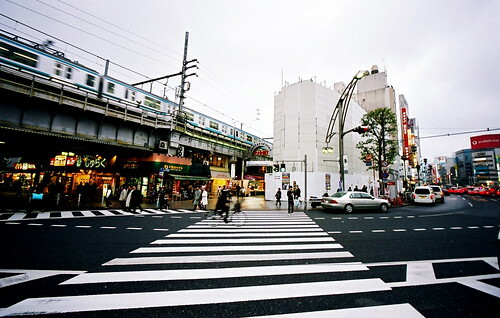 The photo above is taken right outside of Ueno Station, and at the end of the crosswalk is the Ameyoko Arcade, a famous shopping arcade that used to specialize in black market items after WWII. 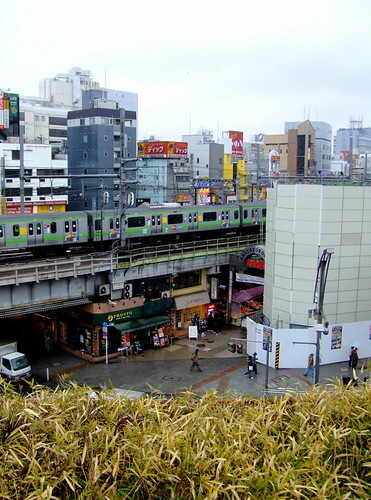 Here’s a view of the Yamanote line seen from Ueno Park.